(Nanowerk News) Researchers at the National Institute of Advanced Industrial Science and Technology (AIST) in Japan have developed a tungsten oxide (WO3) photocatalyst that provides a significantly higher quantum yield under visible light than conventional photocatalysts ("Visible-light-induced oxygen generation from aqueous dispersions of tungsten(VI) oxide"). A photocatalyst-electrolysis hybrid system using this photocatalyst is a hydrogen production system in which solar light is efficiently used. The AIST's original system employs the photocatalyst that generates oxygen by oxidizing water and reducing iron(III) ions (Fe3+) to iron(II) ions (Fe2+). The system also involves low-voltage electrolysis in which water is reduced to generate hydrogen and Fe2+ ions are oxidized to Fe3+ ions. The high efficiency of the WO3 photocatalyst was achieved using a new method—treatment of the surface of the photocatalyst with Cesium (Cs). The activity of the treated catalyst is more than ten times that of untreated catalysts. The quantum yield of the new photocatalyst is 19% under visible light of wavelength 420 nm and is approximately 50 times the previously reported values (0.4%)*. The use of solar energy can reduce the voltage required for water electrolysis by almost 50%. Hence, the low-cost production of hydrogen is expected. In order to suppress the emission of carbon dioxide and create a sustainable society, it is essential to make efficient use of renewable energy. One of the technologies for the effective use of solar energy, which is the most abundant renewable energy, is a low-cost hydrogen-production technique in which water is directly decomposed by photocatalysts to obtain hydrogen and oxygen. This technology has been actively studied as a fundamental technology for a future hydrogen-energy-based society. If a photocatalyst system which is as efficient as solar cells and as simple and inexpensive as plant cultivation is being developed, it can be expected to contribute significantly to the realization of a society that is not dependent on fossil resources. However, the quantum yield and solar-energy conversion efficiency of photocatalysts are still low at present. Consequently, the development of a high-performance photocatalyst system is desired. AIST has studied a photocatalyst-electrolysis hybrid system (Figs. 1 and 2) that can help overcome the disadvantages of conventional photocatalytic hydrogen production. This system can possibly enhance the efficiency of the photocatalyst. Further, it has the advantages of producing pure hydrogen and not requiring a large transparent hood for hydrogen collection. Because of decreased electrolysis voltage, we can also expect to manufacture hydrogen at a lower cost compared to ordinary water electrolysis systems. This system offers the advantages of conventional photocatalytic methods as well as those of usual electrolytic processes. While certain candidate redox media are used for oxidation-reduction reactions, the technique for low-voltage hydrogen production using Fe2+ ions has already been established. Consequently, the use of iron (Fe2+ and Fe3+ ion pairs) as the redox medium is, at present, the most practical technique for the hybrid system. Thus, another major challenge that was faced in the realization of this hybrid system was the development of a high-performance photocatalyst that would reduce the redox medium (from Fe3+ to Fe2+) while generating oxygen from water. Figure 1: Mechanism of the photocatalyst-electrolysis hybrid system. Figure 2: Potential diagram of various reaction mechanisms for hydrogen production via water decomposition. (a) Water decomposition by photocatalyst. (b) Our newly developed photocatalyst-electrolysis hybrid system. (c) Ordinary water electrolysis: high voltage is required. It has already been announced that a WO3 semiconductor photocatalyst can absorb visible light and that its performance in environmental cleanup processes is significantly better than that of conventional TiO2-based photocatalysts when a copper promoter or a palladium promoter is supported on the surface of the photocatalyst. In this study, the conditions for the preparation and surface-treatment of the WO3 photocatalyst powder were optimized to improve the activity of the photocatalyst for the reaction in which Fe3+ ions are reduced while oxygen is generated from water. It was found that the treatment of the photocatalyst with cesium salt significantly improved the photocatalytic activity. Fe2+ ions were stoichiometrically generated in the reaction. It was confirmed that Cs compounds that did not dissolve in water were present on the surface of the treated photocatalyst. The surface area, particle configuration, light absorption, and internal structure of the WO3 semiconductor photocatalyst particles did not change considerably after Cs treatment. There are two methods of Cs surface treatment: one involves the addition of cesium salt to a solution used for hydrothermal treatment, and another involves the impregnation of the WO3 particles with cesium carbonate and sintering the particles at approximately 500°C. High activity could be achieved by both the methods. When the Cs-treated WO3 photocatalyst surface was washed with highly acidic water to decrease the Cs ions on the surface or washed with an iron sulfate (FeSO4) solution, the activity of the treated photocatalyst improved further (196 µmol/h) and was about 10 times that of untreated WO3 photocatalysts (18 µmol/h). We investigated a mechanism for improving the activity of the WO3 photocatalyst surface-treated with Cs. The Cs atoms that were unevenly distributed on the surface of the WO3 photocatalyst were partly removed by using highly acidic water, thereby generating ion exchange sites that do not exist on normal WO3 surfaces. Protons (H+) and water molecules, in the form of H3O+, were specifically absorbed at these ion-exchange sites, where oxygen was efficiently generated by the oxidation of water. At some of these sites, ion-exchange of Fe2+ ions also occurred and Fe3+ ions are rapidly reduced to Fe2+ ions at the sites. Figure 3 shows the time dependence of oxygen generation using the photocatalyst optimized for the highest activity. The reaction for oxygen generation efficiently progressed until all Fe3+ ions added at the beginning of the experiment were reduced to Fe2+ ions. The reaction in both aqueous solutions of iron sulfate and that of iron chloride proceeded stoichiometrically. The photocatalyst exhibited higher activity (256 µmol/h) in the aqueous solution of iron chloride than in that of iron sulfate. The activity of the catalyst did not deteriorate during the repeated experiments. The quantum yield of 19% obtained under visible light (420 nm) was 48 times the previously reported values (0.4% for 405 nm) for WO3 photocatalysts used for the generation of oxygen using Fe3+ ions. We achieved an efficiency of 0.3% for the conversion of solar energy to chemical energy, i.e., the production of Fe2+ ions; this is greater than the highest efficiency value reported previously for solar energy conversion by water decomposition using photocatalyst powder. In comparison to the efficiency of conversion of solar energy to hydrocarbons in photosynthesis, this value exceeds the efficiency for switchgrass (0.2%), which is a well-known plant as a prospective raw material of biofuel. Such a significant improvement in the activity is a great step toward the realization of artificial photosynthesis. In biofuel production, photosynthesized biomass is converted into easy-to-use forms of energy such as ethanol, however, processes such as harvesting, transportation, milling, and fermentation are very complicated. On the other hand, the photocatalyst-electrolysis hybrid system, shown in Fig. 1, can directly produce hydrogen via the low-voltage electrolysis of an aqueous solution of Fe2+ ions. Figure 4 shows the relation between the voltage and current of electrolysis in a small electrolysis apparatus that produces hydrogen using Fe2+ ions generated in the photocatalytic reaction. An electrolysis current was observed at a low voltage of approximately 0.8 V, and hydrogen corresponding to the current was generated at a counter electrode. Theoretically, hydrogen production by ordinary water electrolysis without using Fe2+ ions requires a minimum electrolysis voltage of 1.23 V; however, in practice, a voltage of 1.6 V or higher is required because of the large over voltage of oxygen. In the new hybrid system, the photocatalyst can accumulate solar energy in an aqueous solution of Fe2+ ions, thereby enabling us to achieve a low electrolysis voltage. Various types of power sources including solar cells and night-time electricity can be used for the electrolysis. The results of this study represent a major step toward the development of a system for low-cost hydrogen production utilizing solar energy. The system is based on a low-cost powder photocatalyst system and would contribute to the realization of a hydrogen society in the future. 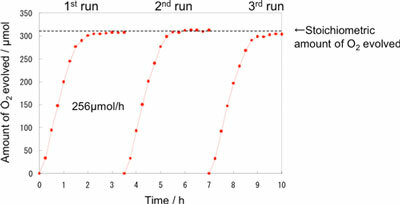 Figure 3: Time dependence of oxygen generation from FeCl3 solution using WO3 photocatalyst that is optimized to achieve the highest performance. The dotted line represents the theoretical amount of oxygen generated when Fe3+ ions (1260 µmol) are completely reduced to Fe2+ ions. Fe2+ ions are obtained stoichiometrically in proportion to the amount of oxygen generated. The reaction is repeated three times using the same photocatalyst so as to confirm its durability. Figure 4: Relation between current and voltage in the demonstrating experiment for Fe2+ reduction and hydrogen generation in the photocatalyst-electrolysis hybrid system using a small cell. 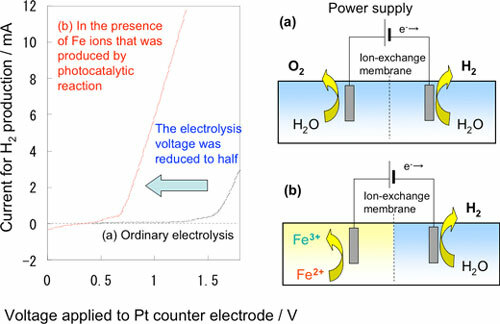 (a) Ordinary electrolysis (b) In the presence of Fe2+ ions generated in the photocatalytic reaction. The results are outcomes of a project sponsored by the New Energy and Industrial Technology Development Organization (NEDO), i.e. "R&D of hydrogen production by water decomposition by using a visible-light-responsive semiconductor photocatalyst and porous photoelectrodes: R&D of search and verification of effectiveness of innovative next-generation technologies including the development of next-generation technologies and the feasibility study of these technologies: Development of systems for hydrogen production, transportation, and storage" (started in FY 2008). If the current quantum yield of the photocatalyst is further increased and any light with a wavelength less than 480 nm can be used for this reaction, the theoretical limit of solar energy conversion efficiency will be 2.4%. And if a semiconductor that can make use of wavelengths longer than that used for WO3 is developed and light with wavelengths up to 600 nm can be utilized, the theoretical limit will increase to 7.5%. We intend to continue our study to improve photocatalysts so as to increase the efficiency of solar energy conversion.